With her new cookbook Martina’s Kitchen Mix: My Recipe Playlist for Real Life, you’ll find your own invitation to step inside Martina’s kitchen and sample more than 150 of her favorite dishes, whether the recipes were passed down from relatives or tested to perfection by Martina herself. Whip up her favorite Weekend Brunch menu, serving Cheddar Biscuits with Bacon, Baked French Toast with Pecan Crumble and Blackberry-Maple Syrup, and a Sparkling Grapefruit Mimosa. 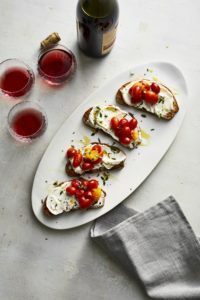 Say “cheers” to happy hour with a Blackberry-Lemon Gin & Tonic while enjoying Whipped Feta Crostini with Roasted Garlic Tomatoes and Fresh Herbs and Baked Olive Cheese Dip. Find balance with healthier fare like Thai Slaw with Peanut Dressing and Creamy Chicken Tortilla Soup. 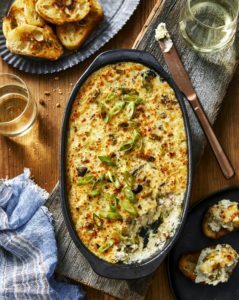 Make memories during dinner while noshing on Chicken Braised in Sun-Dried Tomato Cream Sauce and Smashed New Potatoes with Lemon. And when it’s time to indulge, go for Fresh Apple Cake with Homemade Caramel Sauce or No-Bake Peanut Butter-Chocolate Cookies. With Martina’s Kitchen Mix, you’ll create your own delicious memories with family and friends as you toast to real life.